High quality fully stained maple wood grain skateboard decks. 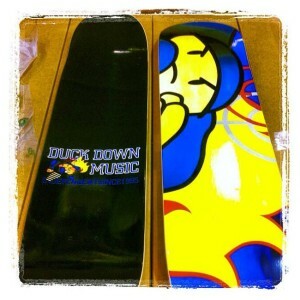 Heat transferred enlarged Duck Down Man graphic on the back and "Duck Down Music Independent Since 1995" on the front. Comes in one color; black top & blue/red/yellow logo on the bottom.